UK-based websites are 5 percentage points better than their US peers at keeping mobile users engaged (with a lower bounce rate), and 2.5 percentage points better at keeping the users from desktop / laptop computers engaged. 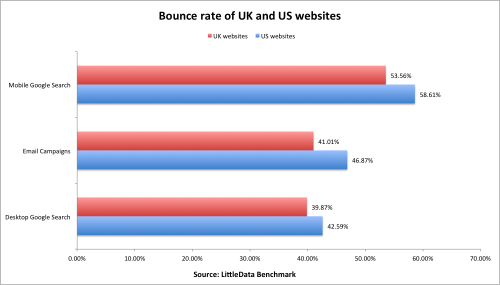 For bounce rate from email marketing, the difference was also 5 percentage points (a 14% better performance from UK websites). The comparison is based on the Google Analytics data from 209 UK companies and 95 US companies collated by Littledata. An example is MADE.com, a London-based furniture retailer which has used superior online customer acquisition to drive growth across the UK and continental Europe. If your website beats those benchmarks that should not stop you improving. Whilst it’s great to know you’re doing well in a particular area, there are many comparative metrics you can check with our benchmarks to fully understand your performance overall. If your site is struggling with engaging users, then check out our suggestions on improving your bounce rate . Want to know how your site performs? Head over to Littledata Benchmark page and click ‘Benchmark your site’ to check your performance against others. We gather data from thousands of Google Analytics profiles, and anonymise them in a series of benchmarks, to give insight into how your marketing efforts are paying off. With this benchmark data, you can stop being in the dark about how your website performs and sign up to see how your site compares. Our customers also receive daily insight into site or app performance with our actionable trends reports. You can explore these and other benchmarks via Littledata Benchmark index page. How would you use benchmarks in your daily work? Leave your comments below.